Mit 'Stand Back!' präsentieren die Musiker um Sänger und Gitarrist RIP CARSON klassischen 'Authentic Rockabilly'. Wilde Shaker wie 'Little Red Hen', 'Stand Back', 'Heart Attack' und 'After School Rock' stehen melodischen Rock'n'Roll-Balladen wie 'Can't Comfort Her', 'Saw Ya Walkin', 'Another Bridge To Burn' und 'Stay For Me' gegenüber. Die Band wurde in den USA schnell übers Radio bekannt und faszinierte mit ihrem authentischen Charme zahlreiche Hörer auch außerhalb der Rockabilly-Szene. Ein Muss für Raw Fifties Rockabilly Fans!! 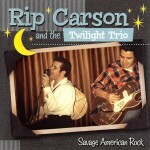 This is RIP CARSON & THE TWILIGHT TRIO 's second CD for Rollin' Rock Records. The first one (Rip Carson & The Twilight Trio, Rollin' Rock CD-102) sold out within a few months, because of the excitement generated by Rip's crazed performances throughout California. Rip Carson's youthful exuberance and enthusiasm are winning him accolades and new fans far removed from our usual rockabilly scene. We can see an example of this crossover in the fact that his first CD is racing up the charts of radio station KUCI outpolling many of the "indie rock", "alternative", and "punk" acts which dominate these charts. RIP CARSON & THE TWILIGHT TRIO are receiving such mainstream support without compromising their authentic traditional American sound, as so many other bands have done by adding hippie-type "fuzz" guitars, etc. These boys have integrity!! To Carson & The Trio there is nothing more modern and exciting than the Real Rock, the Rock of Elvis, and Fats Domino and Little Richard and Gene Vincent and the Johnny Burnette Trio, the Sound Of America's Youth, indeed! This second CD offers us a good mix of savage wild rockers such as "Little Red Hen", "Stand Back", "Heart Attack" and "After School Rock", and melodic rock ballads such as "Can't Comfort Her", "Saw Ya Walkin'", "Another Bridge To Burn" and "Stay For Me", showcasing Rip's versatile and varied style. The superb talents of Danny Angulo on guitar, Reece Linley on bass and Santos on drums are a perfect match for Carson's soulful emotional vocal stylings. The teenagers in America are starting to get bored by all the phony plastic synthesizer music produced by drug-fried brain-dead aging Hippies, and are looking for an alternative to have a rockin' good time. They are looking for a cure to this disease, this cancer which has engulfed America for 35 years, and the cure is right here: RIP CARSON & THE TWILIGHT TRIO !!!!!!!!!! Rockin' Ronny Weiser, the Rockabilly Rebel Westerner from Las Vegas, the Wild Wild West! !